Kerala is still grappling with the consequences of the recent floods that rendered millions homeless and has disrupted trade and commerce across various industry sectors in the State. ASSOCHAM has indicated that Kerala may have suffered economic losses to the tune of Rs. 15,000 crore- Rs. 20,000 crore due to the recent floods that devastated large parts of the State in August this year. An estimated 370 people have died due to the floods, which have been described as “the worst in a century”. The state’s tourism, agriculture, dairy and livestock sectors have borne the brunt of the floods. In the State’s Rs 8 lakh crore Gross Domestic Product (GDP), tourism and agriculture, mostly rice, pepper, cardamom, cashew, tea, coffee, coconut, contribute about 10 per cent each. Internal and external trade too contribute. The external trade not only comprises exports of cash crops and other industrial goods and services from Kerala, but also commercial activities from ports like Kochi and three international airports from the State. All of these components of the State GDP have been badly hit by the floods. Besides agriculture, the dairy and livestock sectors have suffered a loss of nearly Rs 800 crore. Tourism which accounts for 10% of the state’s gross domestic product (GDP), generating around Rs30,000 crore and employing around 1.4 million people has been seriously affected. The worst floods in a century have caused colossal loss of property, agriculture, and infrastructure, which the state has pegged at over Rs 21,000 crore. The State’s GDP is expected to fall to 6.5-7 percent from the budgeted 7.6 percent this fiscal year. Though industry contributes only 26 percent of the state GDP, as 66 percent comes from services. Out of which, only tourism and hospitality contribute 40 percent of the state’s GDP. The damages to roads, where over 10,000 km of the district, state, and national highways have been washed away, will be high as Rs 12,000 crore, while the figure for airports is nearly Rs 40 crore, it has been reported. Moving on, we had organized a seminar on ‘One Year of GST’ on 27th July 2018 at Hotel Park Central Kaloor. The speakers were Mr. G Shivadas (Principal Partner, Lakshmikumaran and Sridharan Attorneys, Bangalore) and Mr. PM Prabhakaran (Partner, Lakshmikumaran and Sridharan Attorneys). Around 104 participants attended the seminar which saw a tremendous response from the audience in the interactive session that followed where many doubts regarding GST were clarified. I am also glad to inform you that the Cochin Chamber is proposing to lead a business delegation from Kerala to the forthcoming Trade Expo Indonesia 2018 being organized by Ministry of Trade, Republic of Indonesia from October 24th to 28th this year. We invite all those who are interested to intimate the Chamber at the earliest in this regard. We also have a few events lined up which also include the Annual Dr. A P J Abdul Kalam Memorial Lecture scheduled for the month of October. The 10th CEO FORUM Breakfast Meeting will be held on the 21st of September 2018.The topic of discussion at the meeting would be “Family Business-Succession Planning.” The Session will be handled by Ms. Akshika Hariharan, Associate Director, Entrepreneurial & Private Business, PwC. 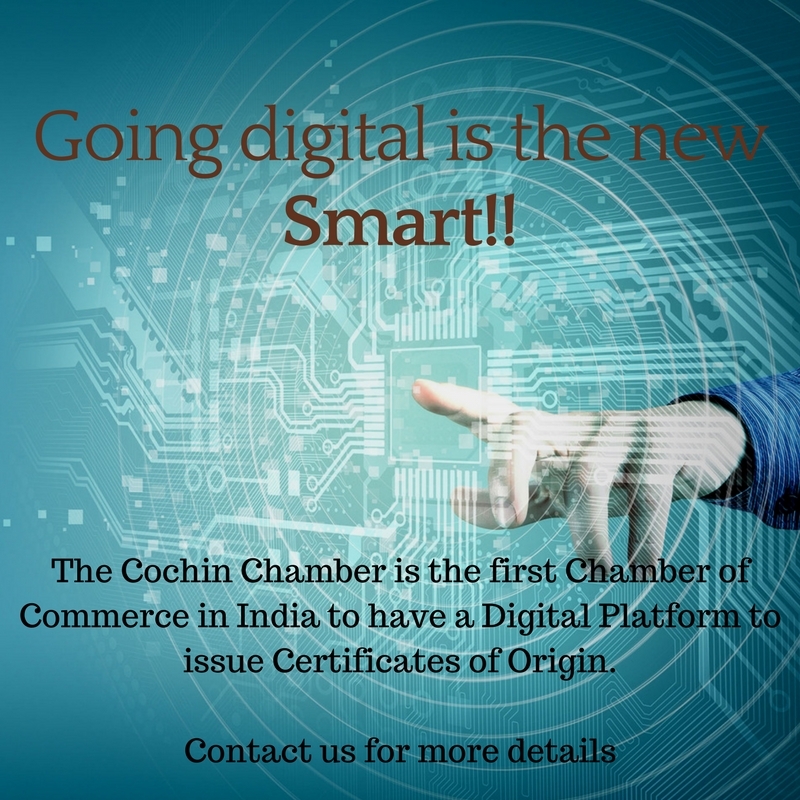 The Session will be held at the Taj Gateway, Marine Drive, Ernakulam. As you are aware, the 161st Annual General Meeting of the Chamber will be held on Tuesday the 25TH of September. At this AGM I will be laying down office after a two year term. 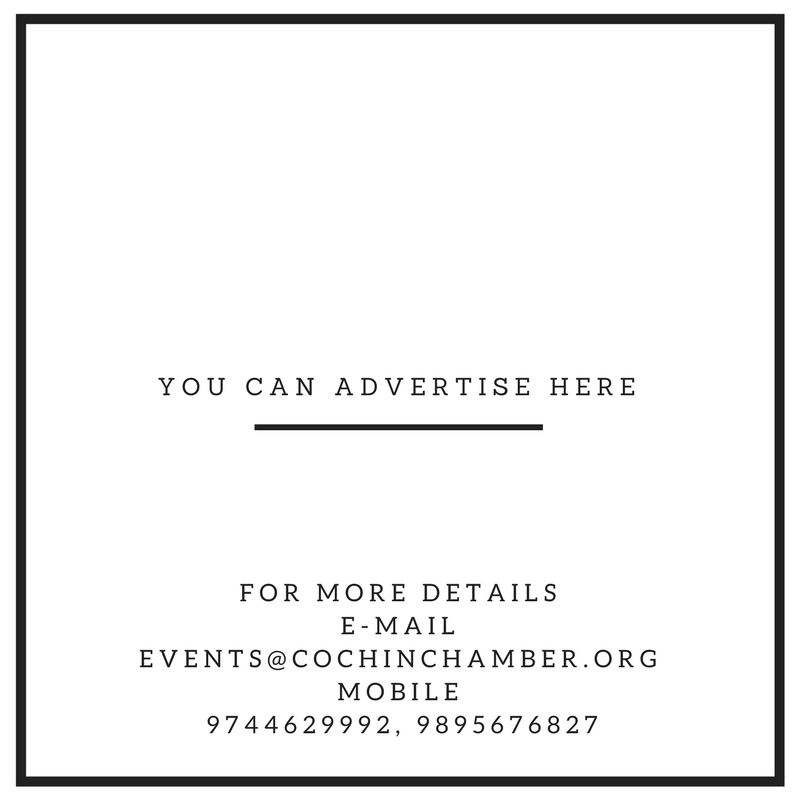 I would like to take this opportunity to thank all the members of the Chamber for their relentless support and cooperation that helped in the smooth functioning of all its activities during my term as President of the Cochin Chamber of Commerce and Industry. While thanking you all I wish the incoming team all the very best for the years to come. The Cochin Chamber organised a Seminar on One Year of GST – Scheme & Coverage on Friday, the 27th of July 2018 from 9:30 a.m. at Hotel Park Central, Kaloor, Cochin. The Session addressed the issues faced by trade and industry in respect of compliance related issues in the last one year of the GST regime. The Speakers at the Sessions were Mr. G. Shivadass (Principal Partner, Lakshmikumaran and Sridharan Attorneys, Bangalore) and Mr. P.M. Prabhakaran (Partner, Lakshmikumaran and Sridharan Attorneys, Bangalore). Mr. V. Venugopal, Vice President of the Cochin Chamber, delivered the Welcome Address. A Q&A session was also held towards the end of the Seminar. There were more than 100 participants from across the industry at the session. The 10th Meeting of the CEO FORUM 2017-18 will be held on Friday, the 21st of September 2018 at the Taj Gateway, Ernakulam. Time: 8.00 a.m. to 10.00 a.m.
Venue: Marina Hall, Taj Gateway, Marine Drive, Ernakulam. Those who are interested/planning to attend the next meeting, please feel free to get in touch with us to register. Without a doubt floods are the most destructive of nature’s forces that can turn our lives topsy turvy in a matter of days as we saw last month. Today, a couple of weeks past the most devastating disaster to hit us, the State is still struggling to come to terms with the situation. The August floods have damaged people’s lives, property, infrastructure etc. in such a manner that it is going to be a long road to recovery. With damages worth over Rupees 20,000/- crores to the State and its economy, the State is looking at a bleak future in terms of rehabilitation and recovery. Kerala is predominantly a consumer state. However, industry sectors such as Rubber, Tea, Tourism, Medical Tourism, Shipping, Information Technology, Automobiles etc. have been badly hit by the floods and are going through very difficult times now. Experts predict a loss of close to 1% from the estimated GDP growth of the State in the year 2018-2019. Destruction to agricultural lands due to the floods and landslides has been substantial. Agricultural productivity of the State is going to take a big hit which in turn will affect millions of people in the farming community negatively and the State as a whole. It is said that only 2% of the farmers in Kerala were insured at the time of the crisis. The huge financial burden of the uninsured is going to be unbearable. The timing of the floods, at Onam time, has huge ramifications since this is when business is at its peak every year. With the State Government and the people of Kerala cancelling the celebrations connected with the Festival, the season basically came to a stand-still as far as economic activity is concerned. The retail textile sector will need a serious fix on their financial losses due to this unexpected disruption. The sale of white-goods was also hit badly. However, the demand created by the loss of goods in the floods might give a fillip to this sector. Another sector badly affected is the Automobile industry which was affected directly as well. With the drop in sales during the Onam Season and also with wide spread damage caused by the floods in many showrooms and car lay-over yards the automobile sector has been badly affected. Many vehicles have been deemed completely destroyed, in turn affecting the Insurance Sector with the consequent pressure of the cash pay-outs to reimburse claims made by their customers. This will directly disrupt the economy by making 5%-6% loss. The insurance claims from Kerala this time around is expected to cross Rupees 1200/- crores. Industry sectors like Tourism, IT, the Services Sector etc. which are primary sources of income for the State have taken a huge blow. With the floods affecting 13 of the 14 districts in Kerala most of the important tourism destinations have been ravaged. Ahead of the Onam vacations, the sudden increase in rains resulted in major room booking cancellations in most of the hotels across the State. Combining the room booking cancellations from customers within the state with the temporary shutdown of the International Airport in Cochin, preventing the inflow of tourists from outside has thrown the Tourism Sector into chaos. The temporary shutdown of the Airport also resulted in cancellations with respect to Medical Tourism as well. Numerous events were either cancelled or postponed during this time. This resulted in large scale drop in banquet sales in hotels and resorts. The State’s infrastructure has been badly hit. With thousands of kilometres of damaged roads and bridges the Government is faced with the humungous task of restoring the State’s infrastructure. The Government’s decision to increase excise duty on liquor sold in Kerala for the next 100 days alone promises to bring in Rupees 230/- crores to the Government, which is to be utilised to rebuild and rehabilitate the State. Given the situation, this decision by the State Government is a good initiative. A natural calamity like the one we witnessed can literally dumbfound anyone. However, as we have been seeing, Kerala and the Keralites are rallying to ensure that we are up and running again. It is hoped that by the time the tourism season starts in early October, things will have improved and we will once again be in a position to welcome visitors to the State as in the past. Yes, it will take a while to return to where Kerala stood a month ago, but this time we hope the return is more realistic and mature in every sense.